As long as I can breathe and stand on my feet, I can never get tired of coming up with new recipes. It’s true that sometimes I fail and the outcome of my effort is not only tasteless but looks ugly too, I didn’t give up for those times when I experiment with a new recipe and the outcome is a gorgeous and delicious treat like this Sweet Potato Cream Caramel. 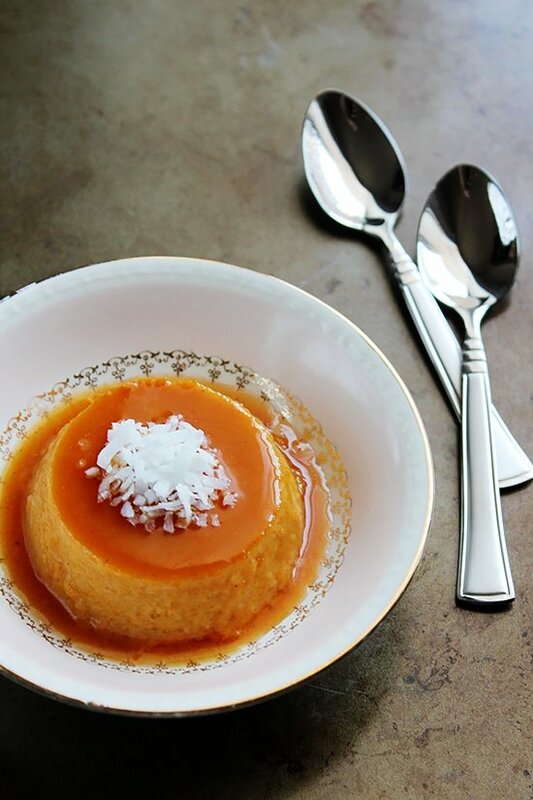 All about Sweet Potato Cream Caramel. 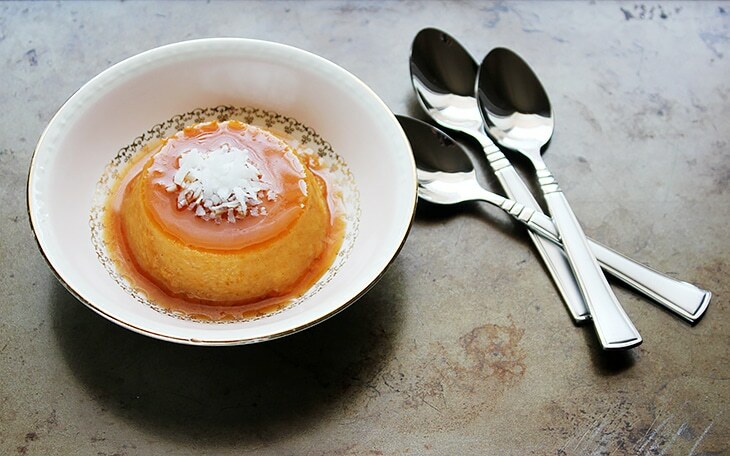 I am crazy about flan or cream caramel, the creamy and velvety texture, the sweetness from the caramel, and the explosive flavor from the combination of ingredients force me to surrender and immediately take a big bite. In my previous posts, I shared recipes for Pumpkin Flan, Cream Cheese Flan, and Coffee Cream Caramel, but today I’m bringing you the Master of all, the Best Sweet Potato Cream Caramel. My husband and mother in law loved Sweet Potato Cream Caramel so much I make it at least one time a week now. I have no complaints of course. 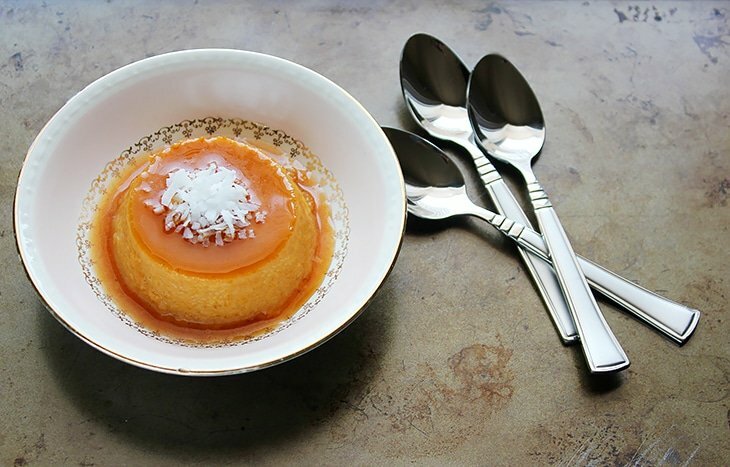 If you love sweet potato dessert, you will love my version of this cream caramel. In case you make it, don’t forget to share your experience with me. 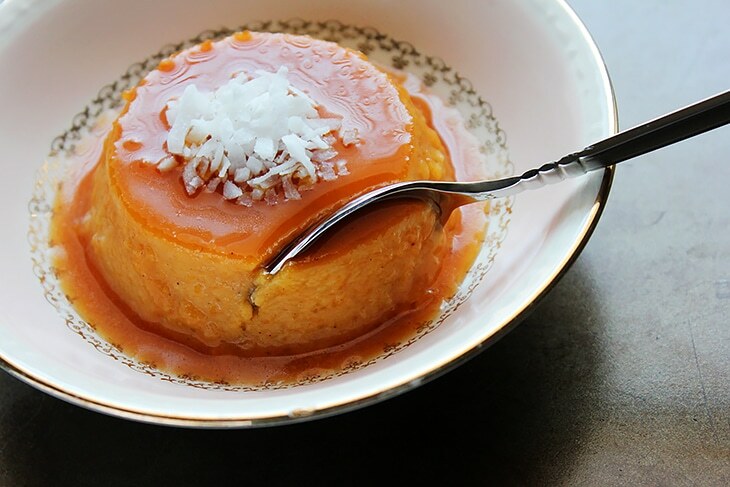 This is the Best Sweet Potato Cream Caramel you will ever have. It's creamy, have balanced sweetness, delicious, and spiced just right. In a saucepan, add the sugar and water. Place pan on medium-high heat. Do not stir but swirl the pan for evenly cooked caramel. When the caramel is slightly dark golden in color remove pan from heat, pour in the ramekins, and let it cool. In a bowl, add the hot mashed sweet potato and butter, whisk well. Add the sugar, vanilla, cinnamon, nutmeg, ginger, and whisk until the sugar dissolves. Add the eggs one at a time and whisk until well combined. Add the milk and whisk again. Pour in previously prepared ramekins. Place the ramekins in a deep large baking pan, add hot water to the large pan until it reaches half the ramekins. I used seven 4 oz ramekins that take a bit more than half a cup of liquid. Bake at 350F/180C for 55 to 60 minutes. Remove ramekins and let it cool. Run a knife around the edges of the cream caramel and invert it on a plate. This looks simply amazing, Muna. I don’t think I have ever had a sweet potato caramel before…didn’t even know it’s possible to make caramel with my favourite root veggie. You are really creative! Oh I want this.. I love sweet potatoes and this looks like a wonderful dessert! You and I Medeja, sweet potato is my new craze, hope you give this recipe a try! Recipe fails come with the territory of blogging, but it’s SO great when the dish finally comes out right! This cream caramel is GORGEOUS!! Loving the use of sweet potato here, my dear! 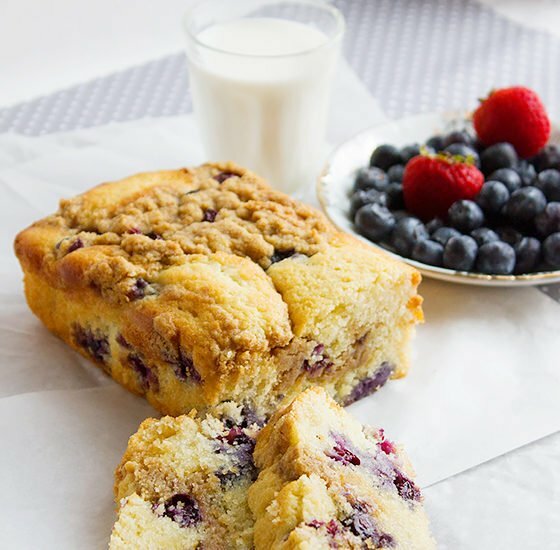 Total dessert perfection! I could use a few of these in my life. Immediately! Cheers, friend! 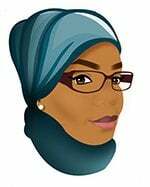 Muna love this sweet potato cream caramel version. In all honesty I had no idea there are different ways to make cream caramel than just plain regular cream caramel!! Your recipes are always so unique & your photography always makes me hungry! 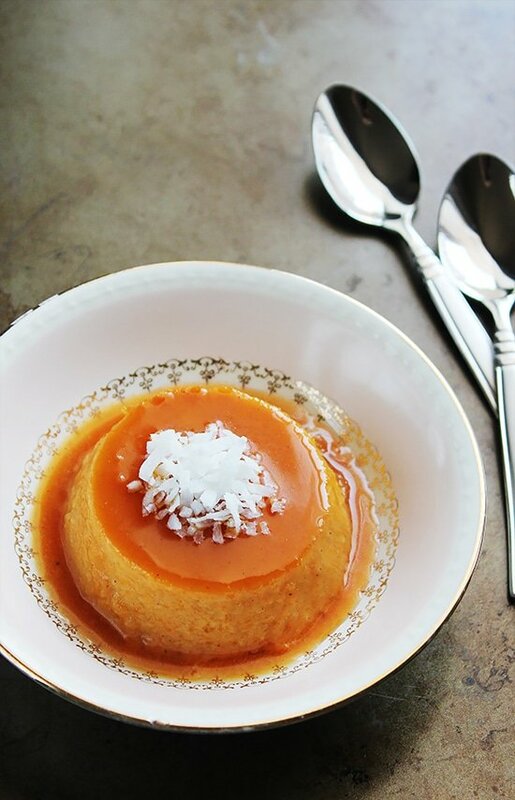 Sweet potatoes are one of my very favorite things and this cream caramel looks absolutely gorgeous! Pinning! Thanks a lot Stephanie, I hope you give it a try! I told you I made the orange cake by yours? Well, I can’t wait to bake this! And you have pumpkin and coffee ones too, amazing! All of my faves! Be ready for tons of questions!